Start taking classes at Hot Yoga and other studios! Welcome! 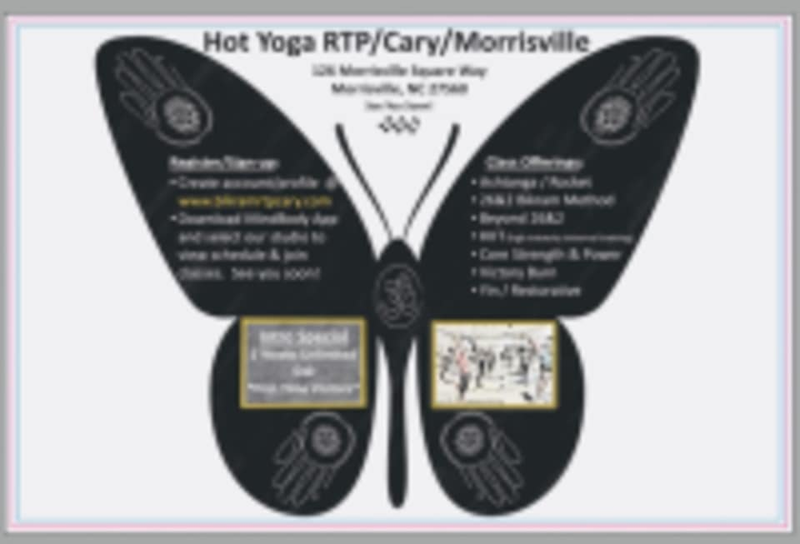 We are a boutique yoga studio on Morrisville Carpenter Rd, between Davis Drive & Chapel Hill Road (<10 miles from the airport, central to Research Triangle businesses and residential areas). We offer a variety of Ashtanga/Rocket, Bikram Method 26&2, Beyond 26&2, and YinYang/Restore yoga classes with variable room conditions for safe & effective practice. To support your lifestyle and yoga practice, we also offer HIIT-High Intensity Interval Training and Core Strength & Power. Our staff is full of passion & experience to share from our teaching journeys PLUS we are musicians, performers, athletes, physicians, massage and movement specialists. Please email your questions hotyogartpcarymorr@gmail.com and we look forward to welcoming you! Please bring photo ID for your 1st visit and we will take a security photo for your future visits. You are also required to provide emergency contact info and sign liability waiver. Rentals include $3/mat and $2/towel. Electrolyte water can be purchased $3/bottle. Water, yoga mat and yoga/beach towel are required for classes. Please sign-up for class before coming, so that we know to expect you and alert you of traffic risk (the best way to avoid Morrisville Carpenter traffic is to access the studio from Town Hall Drive). To sign-up for classes, download the MindBody App from your App Store, select our studio using the same email as your profile, and then join classes. Arrive 10-15 minutes prior to class start time, drink water/electrolytes the day prior to class, avoid eating 2-3 hours prior to class. Dea is amazing, patient, kind, and encouraging. Class for best for intermediate to advanced practitioners. Great class, convenient location, instructor was super welcoming and gave clear direction. This was my first Bikram class and I enjoyed! They should have put in the class description to bring our own towel. But other than that, the class was good! Love this instructor, just wish there was music!! Fantastic, am amazing teacher, wish she was there more often!! I loved the class! It is becoming difficult to find a true Yin class so I was very pleased with the class format. I would prefer that there be less light during the class as the can light was right over my mat and felt like a spotlight but other than the fact it was a little bright in the room I really enjoyed this class! I say it every class, but I truly love Karin. She is supportive, caring, and incredibly friendly. Karin is amazing! So encouraging, motivating and supporting! This is a great class for someone just starting out or someone more advanced! !